Think small for big results – the Troy Barbells 12 Sided Urethane Encased Dumbbell Set with Chrome Straight Handle – 130-150 lbs. has one of the compact designs on the market. Its 34-millimeter chrome-finished handles won’t flake or peel, and they’re press fit completely through the steel slug then welded on the outside. The no-odor urethane heads keep floors and equipment protected, while the 12-sided design helps prevent rolling. The set included 10 dumbbells – one pair each of 130-150-pound dumbbells in 5-pound increments. These urethane dumbbells offer the highest quality available today. Large easy to read numbers on each end of the dumbbells allow for easy weight selection. Set includes a pair each of 130-150lb dumbbells in 5lb increments. Troy Barbell's 12 sided urethane solid steel dumbbell incorporates a unique looking anti roll feature. The solid steel core design offers one of the most compact dumbbells in the industry. The 34mm handles are a hard chrome finish which will not flake or peel. The urethane coating is odor-free and will protect floors and equipment. Solid steel handles are press fit completely through the steel slug and then welded on the outside to provide a totally maintenance free dumbbell. 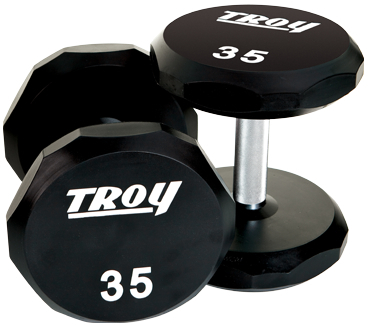 Troy, urethane dumbbells are warrantied for 5 years against breakage or manufacturers defects for the original owner. This warranty does not cover the loss of urethane due to chipping, fading, or cracking. In order to prevent chipping or cracking of the rubber, clean regularly and handle carefully. The dropping of dumbbells is never suggested and will void warranty. Dumbbell heads may become slightly loosened after continued use and loosening is not covered under the warranty. The dropping of dumbbells is never suggested and will void the warranty. Warranty does not apply if there is evidence of abuse from damage due to excessive dropping of urethane products on concrete floors or other surfaces, as this may void warranty. Order your Troy 12 Sided Urethane Dumbbell Set 130-150 lb Set from FitnessZone.com today!